The newly appointed principal at St Mary’s Catholic Primary School, Michelle Holly, says her priority for the Northcote school is strengthening its culture through living out its charism: unity, respect and compassion. New St Mary’s Catholic Primary School principal Michelle Holly. “I want us to build on the good things that are already happening here, and we’ve got a lot of good things happening here. We’ve got a very supportive community, gorgeous kids and a very committed staff. Those three things give us a very strong foundation to move on,” she said. 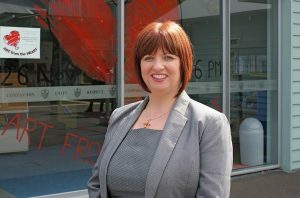 Mrs Holly was assistant principal at Sancta Maria College in east Auckland, in charge of middle school (years seven to 10), before becoming principal at St Mary’s earlier this month. Having been a secondary school teacher in the United Kingdom, she retrained as a primary school teacher when she moved to New Zealand 11 years ago. “I had been thinking for a while about changing from secondary teaching to primary teaching, because also for me the relationship is really important with the child and with their family,” she explained. “As a secondary teacher, what you find is you see lots and lots of kids every day, but actually building those really strong relationships that can make a difference for them is very difficult.” When this position was advertised, she said, it was God-sent. “You can see God’s plan in the things that happen, can’t you?” she said with a laugh. She said faith schools in general, and Catholic schools in particular, have a very different culture. She observed that children in Catholic schools are focused on doing well not only academically but wholly backed by strong Gospel values. Mrs Holly said she wants to continue developing the strong links between the school, the parish and the community. “The parish, the school and the wider community work together for all our children so that every child is able to be successful,” she said. Success, Mrs Holly said, is not just in academic achievement. “We acknowledge that not every child is academically gifted, but they’ve New principal builds on school’s charism New St Mary’s Catholic Primary School principal Michelle Holly. all got Godgiven talents and Godgiven strengths. Our job is to find what those are with the children and to nurture them and to grow them. That’s going to be my focus,” she said. Mrs Holly said the school is going to get 10 new classrooms next year that will enable the school to meet the needs of the 21st century learners. “The staff are undertaking lots of professional learning to help them to design programmes for the children that really meet the needs of the 21st century learner,” she said. “At the same time, we are also working very closely with our cluster schools so that we all have a shared understanding of what 21st learning looks like,” she added. The cluster schools include: St Joseph’s in Takapuna, St Leo in Devonport, Rosmini College, Carmel College in Milford and Stella Maris School in Albany. “The focus is to make sure that our children are getting the very best Catholic education throughout their whole educational pathway from age 5 and, hopefully, to age 18 when they leave school,” she said.